Siskiyou County has been on fire in one place or another for most of the 2014 season. All or most of the fires have been the result of lightning storms and very dry conditions in the Klamath National Forest. While there have been others, The Beaver Fire was sparked in late July from just one of nearly a thousand down-strikes and ultimately burned 32,496 acres. It threatened the entire community of Klamath River for a while. Many of us in Happy Camp were paying close attention, because the fire had closed Highway 96 several times. 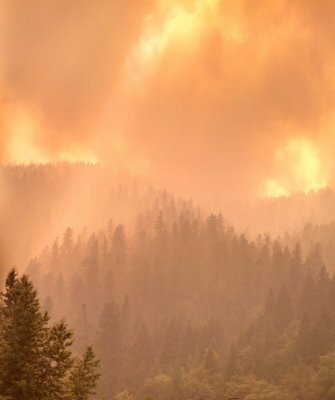 At least 26 fires sparked by the very same storm up in Salmon River country have converged into the “July Complex,” and have burned 47,470 acres so far. The town of Sawyers bar was evacuated for a while, and the Salmon River Road was closed for part of the summer. Another lightning storm that happened on August 12 sparked the “Happy Camp Complex” almost within site across the river from Happy Camp. 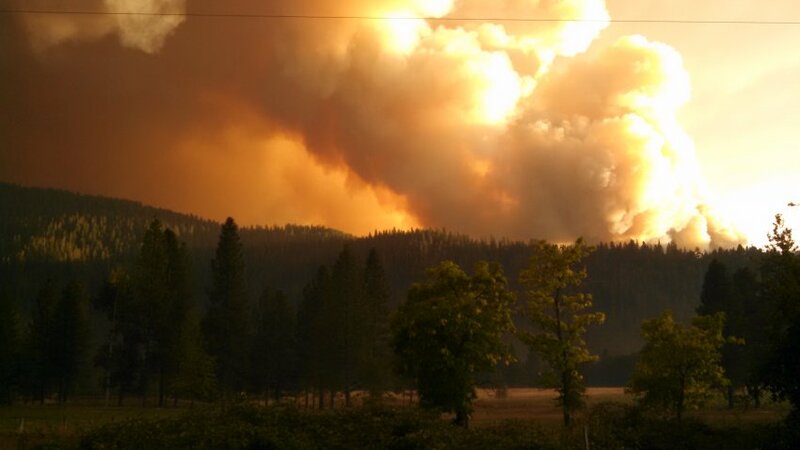 So far, this fire has burned more than 165,000 acres, and is now about 68% contained. During the early days, there was strong concern that the fire would take out Elk Creek Campground, but it ultimately burned in another direction. There are around 1,300 active personnel fighting the fire as we go to press with this newsletter. While the fire has managed to jump over to the south side of Highway 96 several times, fire crews have successfully beat the fire back to the north side. This fire is so large, it presently has the north side of the Klamath River closed from as far upriver as the Scott River, and downriver to Ukonom Creek. That’s more than 50 miles! 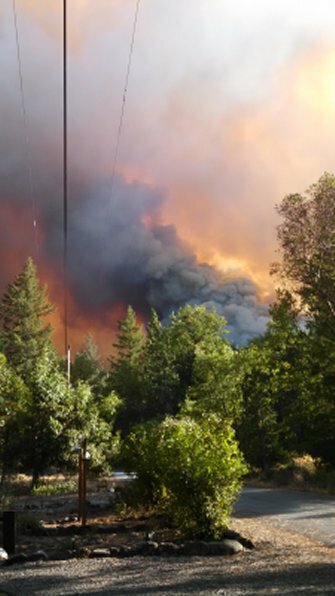 Parts of Scott River remain under mandatory evacuation and the Scott River Road is closed. This means, until further notice, all of our mining properties along Scott River, and and on the north side of the Klamath River from the Scott River down to Ukonom Creek have been closed to prospecting and camping. Our other properties have remained open as normal. Some of these fires may continue burning until the rainy season finally sets in. The authorities have been reopening areas once dangerous conditions are resolved. If you are planning a prospecting trip to our properties, we strongly suggest you make contact with Montine in our office (530 493-2012) for an update on local conditions and information about any areas that may be off limits for the time being. Most of the impacts on visitors to the area are from the smoky conditions. These come and go, depending upon wind direction. There are times in Happy Camp that the air is so clear, you would not even know there are a hundred-thousand acres burning just to the east of us. Other times, the smoke is so thick, you can hardly see across the road. Just to give you an idea of how dry things are in Siskiyou County, another fast-moving wild fire burned about half the town of Weed several days ago, forcing 1,500 residents to flee for their lives while damaging or destroying 100 structures. It does not appear that these fires pose any threat to the town of Happy Camp or our headquarters. We can be thankful for that. 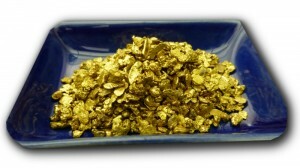 In time, these fires will burn out and we can get back to the business of prospecting for gold. Please refer to our July newsletter for a comprehensive update on our efforts to get suction dredging opened back up in California. We have strong hopes that it will happen in time for the 2015 season. Rich Krimm, Steve Kleszyk and I accompanied our attorney to San Bernardino to participate in Mandatory Settlement Discussions on the fourth and fifth of September. Superior Court Judge Ochoa made it clear during earlier meetings that he believes there is a chance he can help resolve the outstanding issues between all the parties and settle on reasonable suction dredge regulations for California. The Settlement Discussions are confidential, so I am not at liberty to provide detail about how we would resolve the various issues. I will say that the judge decided that we devote the first of two days to issues which appear easier to resolve. And on that note, my own impression was that we made more progress on the first day than I have seen in nearly 10 years of litigation! Having said that, we took up more difficult issues on the second day, and I believe all or most of us departed feeling pretty discouraged. In hindsight, I’m guessing it is normal to experience dramatic up and down-swings when you are attempting to resolve in just a matter of several meetings what would normally require years of litigation. The judge remains encouraged enough that he scheduled two more days of Settlement Discussions that we just finished, and another two days at the end of September. It is clear that the judge wants to move these discussions along without delay. 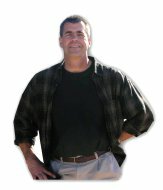 One of the important things that has come to light during the Discussions is that even though the State of California Attorney General’s Office is present at the table, they say they are not representing the California Water Board – which is a State entity that also believes must issue a permit to allow suction dredging in California. Yes; it is true that the Water Board provided funding for the Environmental Impact Statement (EIS) and submitted voluminous material, all which evolved into the 2012 suction dredge regulations which are being contested in front of this judge. It’s certainly not as though they were not directly involved. It is also worthy to note that the Water Board has never before insisted upon issuing a separate permit for suction dredging. We will now submit a Motion to have the California Water Board brought into the active litigation and the ongoing Settlement Discussions. This is because it is unlikely that we will resolve all of the important issues unless the Water Board is at the table. Meanwhile, our attorney has also brought a federal preemption challenge in front of the Third Appellate District of California on behalf of Brandon Rinehart, who was issued a criminal citation several years ago for suction dredging without a permit. We are arguing that the Supreme Court has already decided that the State does not possess the jurisdictional authority to prohibit suction dredge mining on the public lands, which is exactly what they have done with the existing Moratorium in California. The Hearing took place in a grandiose hall (Sacramento); it was like something out of the Roman Empire, with the three judges sitting up above everyone in large thrones. It was a bit surreal! The panel consisted of Justice Harry Hull Jr. as Presiding Justice along with two others, Justice Andrea Lynn Hoch and Justice Ronald B. Robie. They all seemed very familiar with the case and the legal arguments. They played devil’s advocate with both attorneys during the hearing. It is difficult to read the way they will rule. Of course, we are partial to our arguments. James Buchal (our attorney) did a great job for our side. Other than a few local prospectors, The New 49’ers were the only organization present representing the small-scale prospecting community. Thanks to you guys, The New 49ers Legal Fund is paying all or most of Brandon’s costs on this. Brandon Rinehart was present, along with several family members. One attorney for the Karuk Tribe and their environmental partners showed up about half way through the hearing. While all of the normal attorneys representing the State were present, the only one speaking for the State was Mr. Mark Melnick. Mr. Melnick’s primary argument was that the State is under no obligation to issue any suction dredge permits to gold prospectors. I believe everyone present was surprised they have taken this direction. Our attorney speaks to his own arguments in the memo, so I won’t add to that here. We were glad that we moved ahead with oral arguments, because several important misconceptions were cleared up. In any event, it felt like we got a fair hearing. So now we wait to see what comes out of this!! If we win this important challenge, we hope the Appellate District will instruct the State of California that they cannot cite prospectors for using suction dredges unless the activity violates reasonable and lawfully-issued permit regulations. This could possibly help move the Settlement Discussions in San Bernardino along to completion before the beginning of the 2015 season. Let’s all keep our fingers crossed! Please watch for an update in October! Or better yet, sign onto our Internet Forum. It’s a guarantee that legal updates will appear there without delay! Yes; I know that is a heck of a lot of legal activity that we are paying for right now! In anticipation of this, several months ago, I consented to allowing three ounces of my favorite gold nuggets to be used as drawing prizes by The New 49’ers Legal Fund in the ongoing fund-raising effort. There will be 25 prizes in all. Check it out right here! The drawing will take place just before the close of business (5 PM) at our headquarters in Happy Camp on Friday evening, 31 October 2014. That’s only a little more than a month from now. Thanks for all your support, you guys. I know you will all do your best. The fight would have been lost a long time ago if it were not for you! In case you didn’t know, your contribution to The New 49’ers Legal Fund is tax-deductible. Join us for our Weekend Group Mining Projects Next Season! Schedule of 2015 Events: June 6 & 7; June 27 & 28; July 18 & 19; August 8 & 9; and August 29 & 30. Signing up also places you on our Political Action Team. Things happen so fast these days; it takes too long to organize political action through the U.S. mail. As an example, just a few years ago, in concert with other mining organizations, our Internet Action Team killed anti-mining legislation in Oregon in less than a week. All of these future battles will be organized over the Internet since it is so much faster. Please join us in the battle to maintain our remaining freedoms!